DW Hunter is seeking $2 billion plus punitive damages from PepsiCo, The Quaker Oats Company, Pinnacle Foods Group and The Hillshire Brands Company. The great grandson of Anna Short Harrington, the woman who would go on to be known as “Aunt Jemima,” filed a class action lawsuit against on behalf of all of her great grandchildren. The suit asserts that the companies exploited his great grandmother's image and recipes and refused to pay an “equitable fair share of royalties” to her heirs. In 1935, Harrington took on the role of Aunt Jemima which was a character that already existed. The company first registered the trademark for the brand, including Harrington's likeness and image, in 1937. According to some reports, Harrington was selected because of her own pancake recipe, which was then recreated for store shelves. The company continued to use Harrington's image for years after her death in 1955 and licensed her image for a variety of products. Hunter contends that Harrington was an employee of Quaker Oats, and the company denied her employment to evade paying royalties. The claims come on the heels of the defendants allegedly receiving a certified death certificate for Harrington that listed Quaker Oats as her employer. Hunter further alleges that the companies have lied while claiming they could find no employment records for Harrington, or images of her, and yet they had her image deposited inside the U.S. Patent and Trademark Office, according to the document. According to the suit, Quaker Oats sought out Harrington's youngest daughter Olivia Hunter in 1989, ultimately using her likeness to update the look of Aunt Jemima. 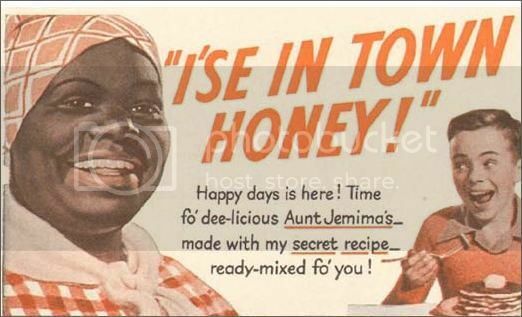 It is this image that is used today on Aunt Jemima-branded products. The suit further alleges a racial element to the exploitation of Harrington and the other women who portrayed Aunt Jemima, going so far as to accuse the company of theft in procuring 64 original formulas and 22 menus from Harrington. It further alleges that Harrington was dissuaded from using a lawyer, exploiting her lack of education and age, so that the company could not pay her a percentage of sales from her recipes.